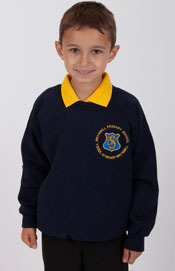 Brynmill Primary School Sweatshirt. Kid's ColourSure sweatshirt. Easycare crew neck raglan sleeve sweatshirt with coverseam finish around neck, welt and raglan. Herringbone taped neck. Woven lable. Fabric: 45% Acrylic, 40% Regen. Cotton, 15% Polyester. Sizes available: 24" to 34" Chest.